What for to use ANSI-encoding for audio tags? Some audio players (software and hardware) not correctly display tags with the UNICODE characters. For example, the old versions of Winamp not support UNICODE characters. We recommend to save tag in the ANSI-encoding for full compatibility with your audio devices also. 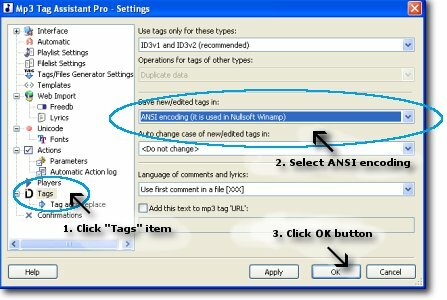 Using Mp3 Tag Assistant Professional you can use ANSI characters for ID3v1 tags and ID3v2 tags on MP3 files or use ANSI characters for ID3v1 tags only. You can use ANSI characters for other types of audio files also. Hint: you can use ID3v2 tags with your national characters and ID3v1 tags with the ANSI characters. Read more... You can synchronize tags also. Open program Settings dialog for change encoding for new tags (see Figure 1). Hint: you can set ANSI encoding on Settings Wizard or Quick Settings dialog (pless the "Ctrl+F9" buttons). The Mp3 Tag Assistant Professional create playlists and filelists in ANSI-encoding by default. This feature can be adjusted on the program Settings dialog (see "Unicode" tree item).